Traffic flows in and out of Los Angeles on Aug. 28, 2018. In its August proposal, the EPA suggests reinterpreting the Clean Air Act to strip away states’ authority to adopt California’s tailpipe standards, even if those limits are upheld. The proposed change tees up a high-stakes legal fight over states’ role in tackling Earth-warming emissions from transportation, the biggest source of greenhouse gases in the U.S. If the EPA succeeds, it would be a huge blow to the coalition of more than a dozen states that see a strong fuel economy program as critical to their climate goals. 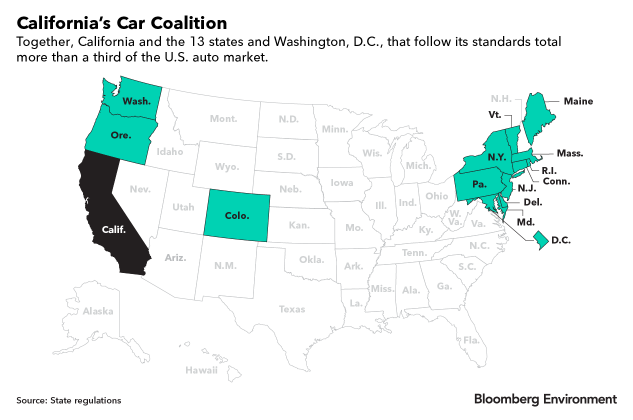 These states make up more than a third of the U.S. auto market. “This is one of the biggest, if not the biggest, environmental issue for a number of these states because it goes to the very heart of a state’s ability to address pollution within its borders, particularly in the absence of any strong federal push to do so,” Elizabeth Klein, deputy director of New York University School of Law’s State Energy and Environmental Impact Center, told Bloomberg Environment. More than half of those states have taken regulatory steps to secure their link to California’s program, even if the federal government reverses course. Those steps could be moot if the EPA’s proposal moves forward. The majority of major automakers—including Ford Motor Co., General Motors Co., and American Honda Motor Company Inc.—have urged the Trump administration to back away from their proposed plan. Instead, the companies favor striking a deal on one national program. Automakers’ worst-case scenario, they say, would be uncertainty brought on by yearslong litigation and separate greenhouse gas standards for cars in different parts of the country. The steps that states are taking to protect their emissions programs could factor into future litigation, too. California can obtain a waiver under the Clean Air Act to set its own tailpipe greenhouse gas standards stricter than federal limits. The EPA and NHTSA are also seeking to eliminate that authority. Other states can adopt California’s rules under Section 177 of the law. To date, 13 states and the District of Columbia have done so. But the EPA has now proposed to reinterpret Section 177 of the Clean Air Act to exclude greenhouse gases. The agency argued that section of the law deals specifically with areas not achieving federal limits on criteria pollutants, such as ozone and nitrogen oxides. Criteria pollutants have national air quality standards that define allowable concentrations in the air. That doesn’t include greenhouse gases. “It’s the one-two punch: withdraw the waiver, and then reinterpret Section 177 to ensure that even if the waiver survives, no state besides California could then adopt California’s standards,” Caitlin McCoy, a climate, clean air, and energy fellow with Harvard’s Environmental and Energy Law Program, told Bloomberg Environment. McCoy added that the Section 177 states should band together to fight the EPA’s move. States are doing just that. State attorneys general have begun to lay out their legal arguments. The agency’s justification for reinterpreting Section 177 is thin, contrary to past practice, and in violation of the agency’s obligations, the attorneys general for 20 states wrote in comments to the agencies last fall. The coalition included attorneys general from California and nearly all the states that follow its standards, as well as top litigators from states that don’t, such as Virginia, Minnesota, New Mexico, and North Carolina. Regulators in the Section 177 states are lining up to preserve their authority by adopting into state law a change California made to its vehicle rules in December. These steps are to make it clear the states “are not tied to the hip of the federal government” if it weakens national limits, Ben Grumbles, Maryland’s top environment official, told Bloomberg Environment. California air regulators adopted an update to its rules Dec. 12 clarifying its “deemed to comply” provision. Crafted during the Obama administration, the provision stated that compliance with the EPA’s vehicle greenhouse gas limits would also meet California’s rules. But the update said the provision doesn’t apply if the Trump administration weakens federal standards from the Obama-era levels through 2025, which California has already adopted. Colorado, Connecticut, Maryland, Massachusetts, New Jersey, Oregon, Vermont, and Washington have formally adopted that change, according to a Bloomberg Environment review of state documents and conversations with state regulators. Maine and Pennsylvania don’t need to take a formal step to adopt the changes, because their regulations will automatically incorporate the most updated California standards, environment officials in those states said. Rhode Island is still reviewing California’s update, but it would need to undertake a regulation to adopt the changes, Mike Healey, chief public affairs officer for the state’s environment agency, said. Environment officials from Delaware and New York didn’t immediately respond to Bloomberg Environment’s request for comment. New York environment regulators appear to be moving forward with a vehicle standards-related proposal, with a hearing scheduled for March 11, but details weren’t available. Environmental advocates say the changes made by California and the other states are small but significant clarifications to sever ties to the federal limits, even before they see the Trump administration’s standards. The moves make a statement that chips away at Trump administration arguments that the current standards aren’t feasible. It is hard to predict how much judges would value the states’ regulatory steps, but they are sending a signal that the technology is possible and the standards are within their authority, Irene Gutierrez, an attorney with the Natural Resources Defense Council, told Bloomberg Environment. “If more states join that legal fight, the clearer the signal gets,” she added.